Having worked with financial executives of airlines through the years, one thing we have learned is that they are all extremely busy with day to day operations and a myriad of reporting requirements. 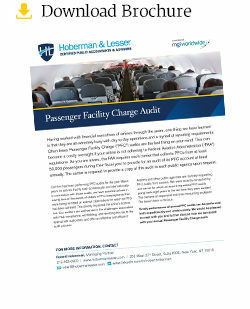 Often times Passenger Facility Charge (“PFC”) audits are the last thing on your mind. This can become a costly oversight if your airline is not adhering to Federal Aviation Administration (“FAA”) regulations. As you are aware, the FAA requires each carrier that collects PFCs from at least 50,000 passengers during their fiscal year to provide for an audit of its PFC account at least annually. The carrier is required to provide a copy of this audit to each public agency upon request. Our firm has been performing PFC audits for the past fifteen years for airlines that fly both domestically and internationally. In connection with those audits, we have assisted airlines in saving tens of thousands of dollars in PFC overpayments that were being remitted on exempt class tickets for which no PFC had been withheld. This directly impacted the airline’s bottom line. Our auditors are well-versed in the challenges associated with FAA compliance, withholding, and remitting this tax to the appropriate authorities, and offer an effective and efficient audit process. Airports and other public agencies are routinely requesting PFC audits from carriers. We were recently contacted by one carrier for which an airport requested PFC audits going back eight years to the last time they were audited. This became an expensive and time consuming endeavor. The lesson here is obvious. Timely performance of annual PFC audits can be performed both expeditiously and unobtrusively. We would be pleased to meet with you and further discuss how we can assist with your annual Passenger Facility Charge audit.